Marriage [is] the covenant of conjugal love freely and consciously chosen, whereby man and woman accept the intimate community of life and love willed by God Himself which only in this light manifests its true meaning. The institution of marriage is not an undue interference by society or authority, nor the extrinsic imposition of a form. Rather it is an interior requirement of the covenant of conjugal love which is publicly affirmed as unique and exclusive, in order to live in complete fidelity to the plan of God, the Creator. Are you looking to be married? In accordance with the norms required by Canon Law, six months’ notice must be given, whether the marriage is here or abroad, to enable the required spiritual preparation to take place and for the paperwork to be gathered and, if necessary, be submitted to the Chancellor of the Diocese. Please make an appointment to see the Parish Priest. The Catholic Church’s understanding of marriage is that it is a unique, indissoluble partnership between one man and one woman, in mutual and lasting fidelity and open to the possibility of bringing children into the world. Anyone getting married in a Catholic Church must have the same understanding of marriage as the Church, even if they are not a Catholic themselves. It is because the Church attaches such importance to marriage, both for the couple themselves and for society as a whole, that she is concerned that couples intending to marry are adequately prepared, and understand what it is that they are committing themselves to. These notes are intended to help couples thinking about getting married in Corpus Christi. The Parish Priest will want some time to get to know you, to make sure you understand the meaning and obligations of marriage, and to help you plan the service so as to make one of the most important days of your lives as good as it can be. He will be able to recommend reading and courses beyond what is outlined here. Your letter of enquiry should contain your names and addresses with contact details and the proposed date for the wedding. Please do not make any other bookings, such as the reception, until you have cleared the date with us. Please also state your religious affiliation and whether you have ever been married before. To be married in the Catholic Church, at least one of you must be a Catholic. 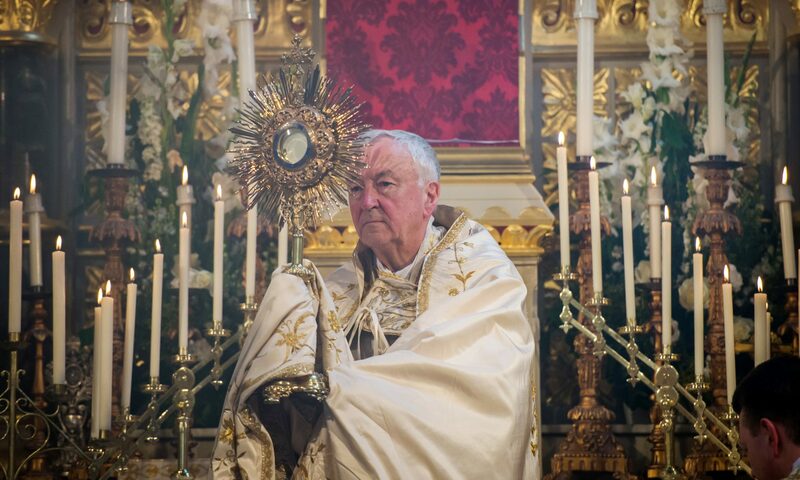 If you do not normally worship at Corpus Christi, please state the name of the parish where you normally attend Mass and give the reasons you wish to marry here. Please remember that it is important to approach the church first before making your plans for a reception venue. No dates will be confirmed until you both meet with the priest from Corpus Christi. The Parish Priest will be in touch very soon after receiving your letter. You should start making enquiries no less than six months before the proposed wedding date. If you do not live within the bounds of this parish, you will require a letter from your local parish priest confirming that he has no objection to you being married at Corpus Christi. A Declaration of Freedom to Marry for each party, notarised by a Commissioner for Oaths (Solicitor). You can download this document here. A baptismal certificate from the church where you were baptised: a new dated within 6 months of the date of the marriage for a Catholic, the original certificate for other Christians. From your local Registry office: a certificate for each of you which permits you to be married. These must be applied for as soon as possible and not less than fifteen days before the wedding. The certificates must be given to the priest by law before the ceremony so please deliver them as soon as possible. It is absolutely essential that the certificates are presented since the wedding cannot take place without them. The Legal name of the church is Corpus Christi Catholic Church, Maiden Lane. A £50 cheque, payable to WRCDT, for any situation when one person is not a Catholic. This is to cover administration costs for the Diocese of Westminster. All of these things will be discussed when you meet with the priest. Your wedding should be the culmination of much prayer and reflection. What you are preparing for is a Catholic Marriage, with all that requires, and not just a church wedding. Your priest will guide you in this process. To assist you in this, it is required that both of you attend a Couple’s Course in a parish near to you or at St Mary Moorfields near Liverpool St Station (Telephone 020 7247 8390), Holy Apostles, Pimlico (Telephone 020 7834 6965) or St Mary’s, Cadogan Street (Telephone 020 7589 5487). The priest at Corpus Christi will require the certificate from the course. You may choose to have a Nuptial Mass, or a Wedding Service with or without a Eucharistic celebration. Please consult with the priest helping you regarding this question. Our organist is not based at the church during the week but you can contact our Director of Music by email musiccorpuschristi@gmail.com The Director of Music is at the church every Sunday morning for the 11.30am Mass, and so he will invite you to the church for a personal discussion regarding the music. Please note that only sacred music may be used at weddings. You can employ any photographer you wish and they will be allowed only at designated places in the church. The use of video cameras is permitted with the same conditions and without additional lighting. Father will advise you on additional charges when video cameras are used. Under no circumstances is the use of confetti of any kind permitted inside the church: outside the church is fine. The basic fee for getting married at Corpus Christi is £500 for parishioners. These fees may be reduced or waived in cases of hardship or where one of the parties is a resident parishioner or a long time regular worshipper. If you are a UK tax-payer, the fees should be gift-aided (an envelope will be provided). The fees for the music vary depending on your requirements: please make these arrangements directly with our Director of Music (see above). Should you require further assistance or clarification, please do not hesitate to ask. It is our wish to make the day of your Catholic Marriage as memorable as possible.